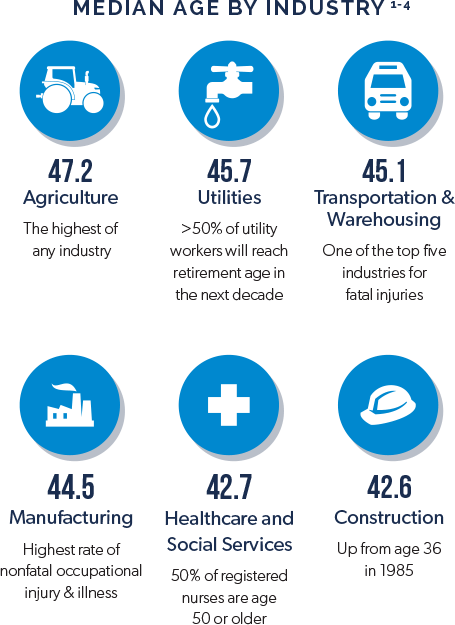 The average age of the American worker continues to increase, providing many benefits to employers and raising some special concerns about health and safety. 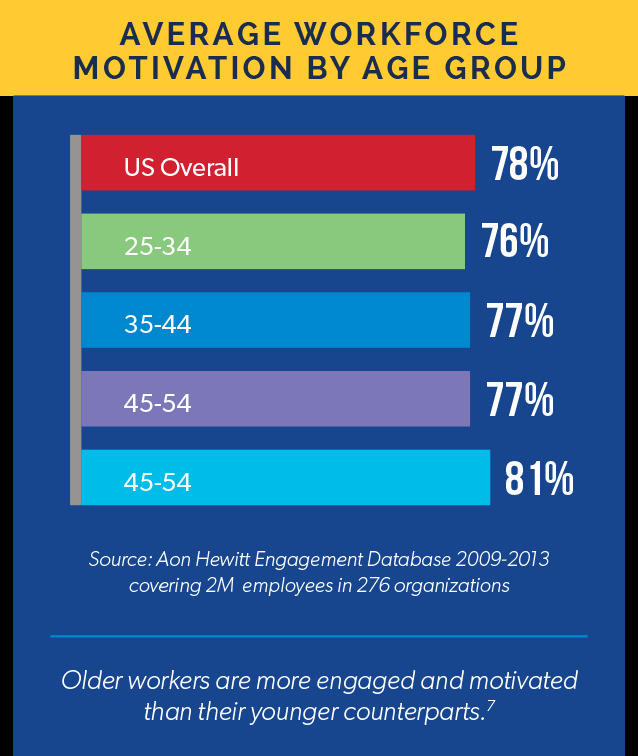 Older workers are not only more experienced, they are also highly engaged and productive. And, while age is an essential factor in determining safety risks and appropriate patient care in workers’ comp, general health issues occurring across the entire workforce population may be more significant. An older workforce is a positive development in a number of ways: there is no substitute for experience, as the saying goes, and mature workers exhibit good judgment, strong work ethic, reliability, loyalty, motivation and, perhaps most important, high levels of engagement. Mentors for Millennials: Older workers provide a good counterbalance to young millennials, complementing their innovation and creativity with professional experience and industry knowledge. Overall, having more people over 50 in the workforce is a big plus for employers. However, as noted in our previous article from the Winter 2017 issue of RxInformer, “Patient Age: More Than a Number in Rx Management,” the aging workforce also brings with it some special considerations for workers’ compensation. 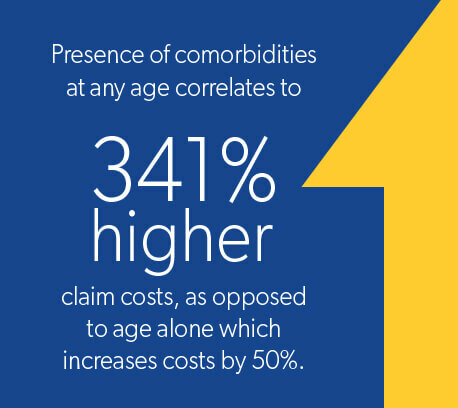 The high prevalence of comorbidities in the general population is undoubtedly part of the reason for an increase of workers’ compensation claims with comorbid conditions, which almost tripled from 2.4% in 2000 to 6.6% in 2009.12 Other reasons for the increase might be that some workplace injuries may be involved in the development of chronic conditions, such as prolonged pain leading to depression, or simply that more providers are noting the presence of pre-existing chronic conditions in medical files. Older adults are also dying from drug overdoses at much higher rates. In 2015, adults aged 45–54 had the highest death rate from drug overdose at 30 deaths per 100,000, and the greatest percentage increase in the drug overdose death rate was for adults aged 55–64, from 4.2 per 100,000 in 1999 to 21.8 in 2015, an average increase of 10.5% per year.14 Opioid abuse is driving the high rate of drug overdoses across the board and older patients may warrant special attention from workers’ compensation opioid management programs. And that is good news for employers and insurers because it means that, in addition to reducing the risk of accident and injury, actions can be taken to reduce health risks and their impact on chronic conditions by offering employee health benefits that promote health and wellness. One way that general health risks can be reduced is with an employee wellness program. Taking many forms from gym membership discounts to on-site nutritional programs and health screenings, wellness programs have been highly effective in improving employee health. The positive impact on workers is even greater when wellness initiatives are combined with risk management programs that include careful candidate screening, safety management, and employee education. A culture that prioritizes health and safety not only reduces the incidence of accidents, it increases the likelihood that workers who are injured will recover well, reducing recovery times and workers’ compensation claim costs. Educating claims professionals about the biological processes of aging and the potential complications associated with comorbidities and health risks, as well as the importance of managing polypharmacy and opioid use, will go a long way in ensuring the best care and outcomes for older patients. And, perhaps the strongest safeguard against complex and costly claims in workers’ compensation is to assess and actively address health risks for all workers, regardless of age. Complications and costs for injured workers can be minimized with the right clinical management and care coordination strategies. 1 -Labor force statistics from current population survey. Bureau of Labor Statistics. https://www.bls.gov/cps/cpsaat18b.htm | January 19, 2018. 6 -Hewitt A. A business case for workers age 50+: a look at the value of Experience. AARP. https://doi.org/10.26419/res.00100.001 | April 2015. 7 -Borsch-Supan A, White M. Productivity and age: evidence from work teams at the assembly line. Mannheim Research Institute for the Economics of Aging. 8 -Top 5 workers’ compensation claims and their Causes. Insurance Journal. https://www.insurancejournal.com/news/national/2016/05/18/409006.htm | May 18, 2016. 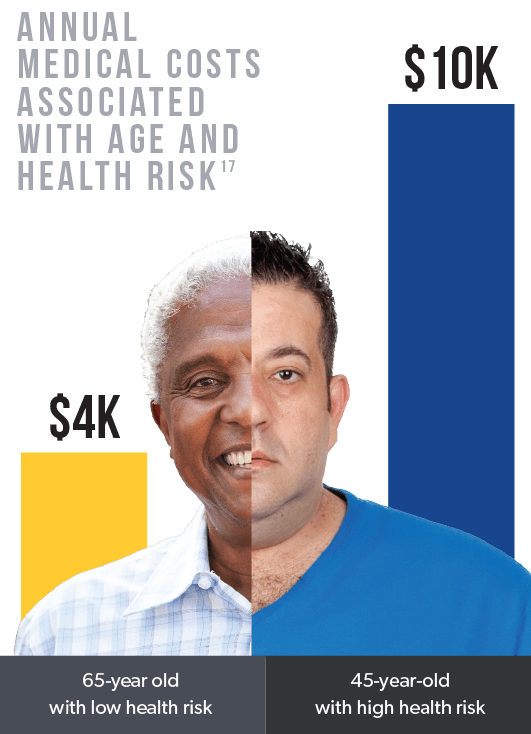 9 -Older workers effect on workers comp injuries and costs. Claims Journal. https://www.claimsjournal.com/news/national/2016/01/25/268384.htm | January 25, 2016. 10 -Chronic conditions among older Americans. AARP. https://assets.aarp.org/rgcenter/health/beyond_50_hcr_conditions.pdf | March 2009. 11 -Laws C, Colon D. Comorbidities in workers’ compensation. NCCI. https://www.ncci.com/Articles/Documents/II_Research-Brief-Comorbidities-in-Workers-Compensation-2012.pdf | October 2012. 13 -Hedegaard H, Warner M, Miniño AM. Drug overdose deaths in the united states, 1999-2015. Centers for Disease Control and Prevention website. https://www.cdc.gov/nchs/products/databriefs/db273.htm | February 2017. 14 -New research shows impact of underlying conditions in workers’ compensation claims. Harbor Health Systems. http://harborhealthsystems.com/new-research-shows-impact-of-underlying-conditions-on-workers-compensation-claims | December 21, 2016. 15 -Davis J. Workers compensation claim frequency – 2012 update. NCCI. https://www.ncci.com/Articles/Documents/II_WC_Claim_Freq-2012.pdf | July 2012. 17 -Keeping aging workers safe on the job. Property Casualty 360 website. https://www.propertycasualty360.com/2017/09/05/keeping-aging-workers-safe-on-the-job/?slreturn=20180316144545 | Sept. 5, 2017.